There are still 2 days left when you can receive an extra 40% discount on selected regular priced tems. 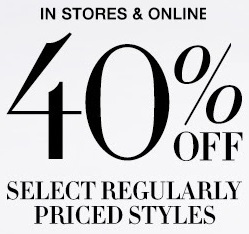 Offer is valid at U.S. BCBGMAXAZRIA stores and BCBGMAXAZRIA online. Source of the information is BCBGMAXAZRIA. Offer is valid until July 24, 2016. For more details visit any U.S. BCBGMAXAZRIA store or BCBGMAXAZRIA online.